This dessert along with a scoop of vanilla ice cream, is a perfect ending to a meal. It is a moist chocolate cake with whip cream between the layers and iced with a thick chocolate frosting. Keep the cake in the refrigerator but allow it to sit out and come to room temperature before serving. Leftovers keep nicely for a few days in the refrigerator. 1. In medium-sized bowl, combine cocoa with boiling water, mixing with wire whisk until smooth. cool completely. Sift flour with baking soda, baking powder and salt. Preheat oven to 350'. 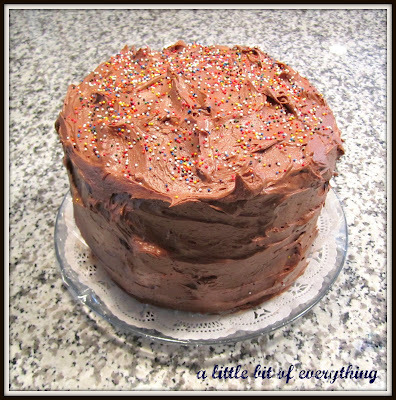 Grease well and lightly flour [ I use instant cocoa mix] three 9" x 1 1/2" layer cake pans. 2. In large bowl of electric mixer, at high speed, beat butter, sugar, eggs and vanilla until light (about 5 minutes), scraping bowl occasionally. At low speed, beat in flour mixture ( in fourths) alternately with cocoa mixture (in thirds), beginning and ending with flour mixture. Do not overbeat. 3. Divide batter evenly into prepared cake pans; smooth top. Bake 25-30 minutes or until surface springs back when gently pressed with fingertip. Cool in pans 10 minutes. Carefully loosen sides with spatula; remove from pans; cool completely on wire racks. 4. Filling: Whip cream with confectioner's sugar and vanilla; refrigerate. Assemble cake: On plate, place a layer top side down; spread with half of the cream. Place second layer top side down; spread with rest of cream. Place third layer top side up. 5. Frosting: with spatula, frost sides first, covering whipped cream; frost top with remaining frosting, swirling decoratively. refrigerate at least 1 hour before serving. to cut, use a thin-edged sharp knife; slice with a sawing motion. This is a recipe my mother used which couldn't be easier or tastier. Melt chocolate and butter together. Mix sugar, milk, vanilla and salt. Blend chocolate and sugar mixture together. Beat until smooth and begins to lose it's gloss. Oh wow, this looks delicious! Chocolate is one of my weaknesses and I can't wait to try this recipe. Now that's what I'm talking about!!! You have no idea how badly I want to eat this right now, lol! Looks yummy. This cake is so gorgeous that I'd feel guilty eating it! You clearly put 100% into everything you do. 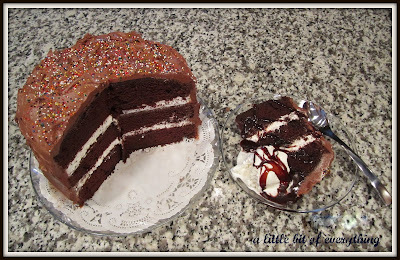 I am a serious chocoholic married to a diabetic husband...so I will need to get tastavision to enjoy your amazing cake! I can only imagine how glorious it tastes though! That looks positively sinful! Thanks for printable recipe!! Wow. That looks so good. Chocolate cake is so delicious. Thanks for posting this. I stopped by from Mingle Mondays. Please follow my blog if you get a chance. That cake looks SO YUMMY!!! I'm a new follower - found you at the Follow Me Chickadee party! I've got some great giveaways right now and huge list of more to come! That looks wonderful. I'll definitely have to put that in my "to make" folder. Chocolate cake is my favorite dessert! Yours looks awesome! This looks wonderful! I've never thought of adding filling to my cakes. Thanks for linking up for TT again this week! That looks like a little piece of HEAVEN! Wow, your chocolate cake is pretty and looks delicious! I want a big piece of this cake! It looks ever so yummy! I'm going to have to try this! I am also a follower and on Thirsty Thursday. That cake looks SOOOO good I want to lick my computer screen! This chocolate cake looks fabulous! I'll have to try it soon!